I am curious, how does a dot sight cause this problem? Does it move somehow? I'm guessing the windage & elevation adjusts crap out and the dot just wanders around. LenV, I just checked - I can add it to my shopping cart, so it's apparently still available. You will find the text "Save 15% THESE SIGHTS with the code Aimpoint Article. If you're still having trouble, call Ike Stephens at BigtexOutdoors, who is the person who helped me. Mike. Sorry, not true . You asked what it would cost with the standard mount. I checked. It is 724.00. Only about 25.00 more then without. Worth getting... But they are sold out (the mount). I am not having trouble. I have zero desire to spend 600.00 on a dot that just goes down in value. I like Aimpoints don't get me wrong. I now have 6 of them and have a little less then 750.00 into all 6. I kind of wonder why I bought the 2000 but 3000, 7000 and 9000 are super nice. Just shot State matches (Oregon) and had one of each in the match. Call me a cheapskate. Oh, you mean the mount is sold out? I didn't realize what you meant. There is a 15% discount on the sights. I never even checked on the mount, as I have a spare, since I replaced the stock mount with a Kodiak mount on my Salyer. Yep, with the discount, it's $600 or so. It's a lot more than other sights, but it's $100 less than what I was going to have to spend with MidwayUSA. 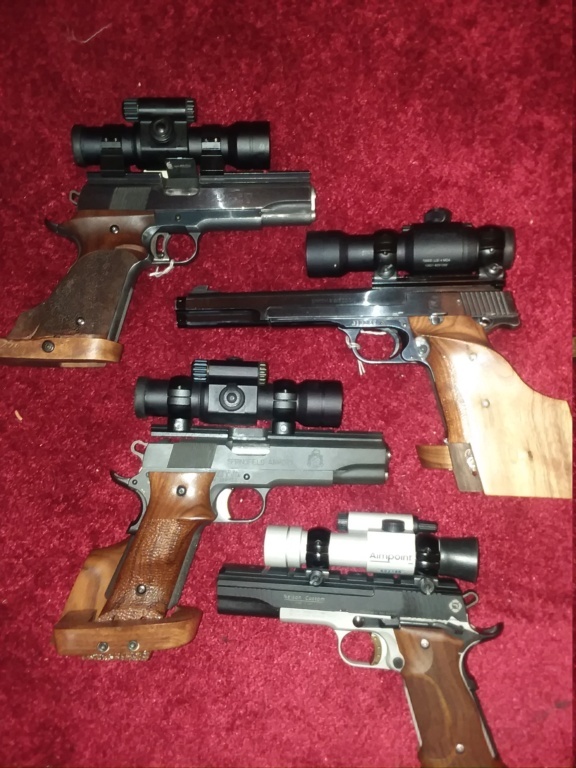 I only know what I see, and have only used four tube-style sights, ADCO, Tasco, Matcdot II, and Aimpoint H-1. 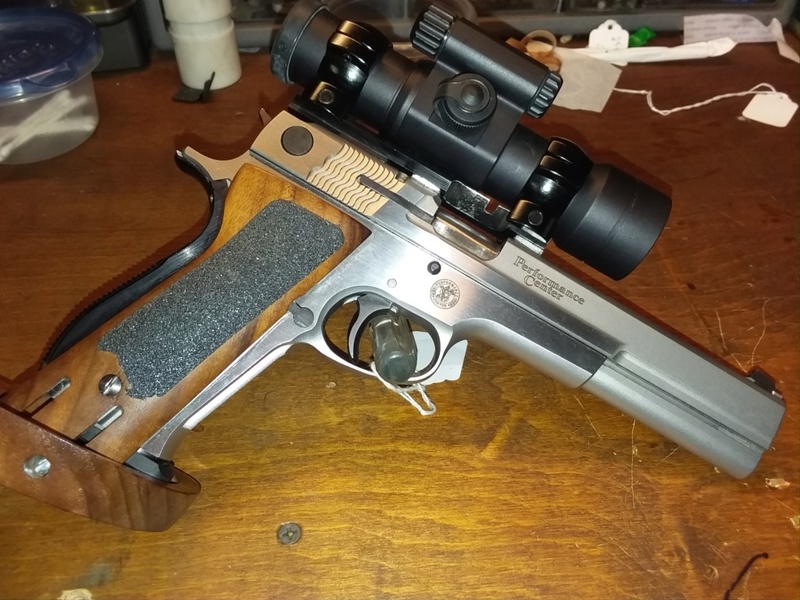 As a photographer, I prefer the image through the Aimpoint, and as a 74-year old dude who isn't as strong as he'd like to be, I greatly prefer the reduction in weight with the Micro Sights. If you did get one, for a wad gun, plan on $100 more for the Kodiak machined steel mount from KC. ....you've got a very nice collection!!!! Allgoodhits wrote: … anyone have an user opinion on the UltraDot HD micro ? If I remember right, I was told it is off-set to the side. I never found anything good about it, so I stopped searching. a friend said that you could see my shots shifting down as I was shooting the strings. each shot went farther down and right the equivalent of a click or two... the elevation and windage adjustments are slipping. Was it in the vortex base or the kodiak base??? paul noles wrote: Was it in the vortex base or the kodiak base??? I put a Sightron 30mm on a frame mounted 45 I built. I liked it better than the UD 30 mm. It didn’t have negative magnification. I personally only use Aimpoint Micro and 9000SC on my pistols. 2 moa only and have no issues with the fit being not bright enough or distorted. What about Bausch & Lomb 2x? Hate to be the bearer of bad news, but Aimpoint doesn't make a 4 MOA dot any more. Just 2 MOA across the board. That change was done the beginning of the year. Thank you KC for the heads up on the 4MOA at Perry, I picked up 2 Just waiting until you get the Kodiak for the Pardini back in stock. My crossfire died on the range yesterday. I had it slide mounted on a 9mm and the light/dot quit. I took it apart and did an autopsy. The batterie has 6 little clips that hold it in place and make the ground contact. Most red dots also have a contact point with the screw cap to insure ground. The Vortex has a rubber pad there instead. The 6 clips had lost any tension they might of had and with no contact to the cap it just quit. Aluminum foil to the rescue. I placed a little behind two clips and also made a cut out in the foam for a little ball to go in the cap. The light/dot works again. I am going to look around for a small spring to go where I put the ball in the cap so vibration doesn't loosen it up again. I've had 2 of them, one was a replacement for the first which would not hold zero after about 1000 rounds on my S&W 986 9mm. The replacement did the same thing. I requested the Matchdot to replace the second Micro. I did not like the optics after about 200 rounds so I mounted a Burris 2x scope which gets better results off the bench, which is where all my shooting takes place. I'll probably sell the Matchdot. FWIW. kc.crawford.7 wrote: Hate to be the bearer of bad news, but Aimpoint doesn't make a 4 MOA dot any more. Just 2 MOA across the board. That change was done the beginning of the year. I am glad I got my 4 dot units. LenV wrote: My crossfire died on the range yesterday. I had it slide mounted on a 9mm and the light/dot quit. I took it apart and did an autopsy. The batterie has 6 little clips that hold it in place and make the ground contact. Most red dots also have a contact point with the screw cap to insure ground. The Vortex has a rubber pad there instead. The 6 clips had lost any tension they might of had and with no contact to the cap it just quit. Aluminum foil to the rescue. I placed a little behind two clips and also made a cut out in the foam for a little ball to go in the cap. The light/dot works again. I am going to look around for a small spring to go where I put the ball in the cap so vibration doesn't loosen it up again. Or just take advantage of their stellar warranty and get a new one. I personally think Vortex could "up" their red dot game, they focus too much on the tacticool crowd. I'm a fan of their scopes in general.